The Power Of Acupuncture. Treat Any Condition – Without The Needles, From Migraine, Arthritis, PMS, Headache, Back Pain, Sinus Problems, Stress And Pain In General. Now supplied with instructional DVD, 160 Conditions To Treat Booklet, Gold Probe, Cotton Bud Probe for the eyes and Auricular Clips for treating points on the ears to help with stress and sleeping. 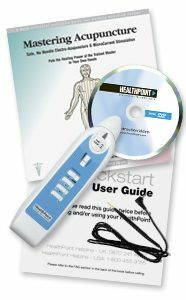 HealthPoint can be used to relieve any condition that can be helped with acupuncture.